Welcome to our page packed full of all the latest Minions Dolls and Toys. Illumination really struck good when they created the little yellow sidekicks for Gru, in their animated movie premiere, in Despicable Me. After seeing the Minions on screen with all their wonderful Minion charm and charisma it's not unthinkable to imagine them in their own feature! And hurrah, they have it - the Minions Movie is utterly awesome, and our mantra is always, where there's an awesome animated movie, there's an even more awesome set of dolls and toys - and yup, the Minions dolls and toys are no exception. If you, or someone you know is a fan the fabulous little yellow people, then this is the page for you, as right here, you will find all you need to in the way of gorgeous Minions Dolls and Toys. Whether or not you have a favourite Minion, or just gaga for Bob, you will find all you need. 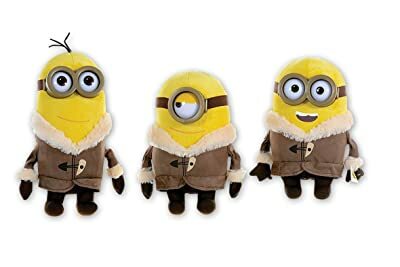 If you can’t wait any longer and need to feast your eyes upon everything you can get to do with Illuminations precious Minions Movie, then you can go straight to Amazon.com’s dedicated Minions Dolls page right here now. …but don’t worry, if you’re from the United Kingdom, then you can find Amazon.co.uk’s Minions Movie offerings right here. Lastly, don’t forget to add this page to your bookmarks and keep checking back for more and more Minions dolls and toys being added all the time…now whattya waiting for you, scroll down and explore…have you seen those Minions funkos?? Hurrah! Here they are, the brand new range of Minions dolls, especially to coincide with the new illumination movie, Minions! Yep, it's true, there are always minion dolls and toys to buy, but with the new movie, is a new set of designed Minions. So here they are, ready in their guide from the Icey stage of the movie - cute right? I love the duffle coat detail! They come in at roughly 30cm tall - so a substantial size for your collection. Whether or not you love Bob, Stuart or Kevin, just click on the pic, or the buttons below, where you get your hands on all three uber cute minions, or you can just get your favourite one. Which of the Minions do you like best? Yep, it's a toughie, I know, but which of the Minions is your favorite? I guess you could look at it another way - do you prefer your minions with one or two eyes? Hahaaaa! They each have their own unique personality, but at a push, which one makes you laugh the most, or tugs on your heart strings the most? Take the quick poll right here, we wanna know what you think! If you're looking for more of a Minions toy figure, this is the one for you. Less cuddly, but just as cute. Here we have none other than Bob the minion, as King Bob! But it's not just any old action figure, this one comes with tons of fab features. There are hidden little buttons throughout the figure that means you move King Bob's eyes and head...completely poseable arms and feet too. 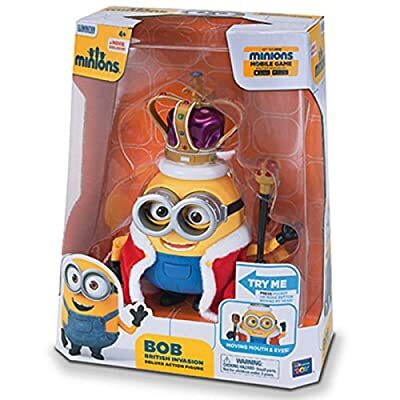 The details are gorgeous - the crown, septre and robe finish Bob the minion off brilliantly, to make the perfect addition to your Minions dolls collection. Yes! Yes! Yes! Funko have released their versions of the minions fresh in time for the Minions movie! Here, you can get them all in one simple click - but of course, you can get them one by one if that's what you would prefer! 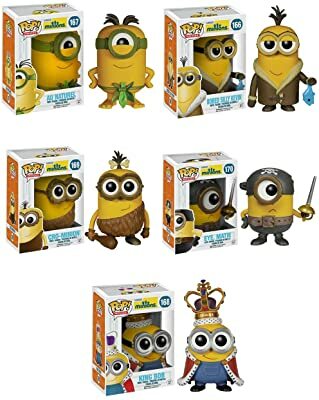 There are currently five different Minions funko toys, including Pirate "Eye Matie", Caveminion "Cro-Minion", "Bored Silly Kevin", Beach "Au Naturel" and of course, who could forget, "King Bob". This little dudes are so desirable, but never more so than in their designer toy, Funkp guise. I love them aaaaand MUST. GET. THEM. ALL... aaaaahhhh! Funko Minions Movie Mystery Minis - The Complete Set of 12! Uh-huh! Just when you thought Funko couldn't get cooler, they release another wave of Minions Movie dolls, and this time, they're mini versions...and there's more to choose from you! They're just sooo darned cute, it's so hard to pick which minion to get...fear not...here, you can simply get them all in one delicious swoop, so the pain of choosing is completed eliminated - don't say I don't look after you! 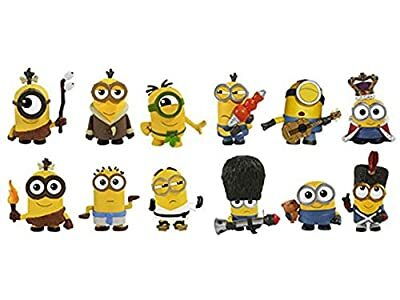 Please tweet me and let you now what your favorite minion is in this collection...personally, I love King Bob...but think the french revolution "Vive le Minion" is also totally awesome. It's just a shame there isn't a ba-na-naaaa minion here, but hey...we can't have everything, can we? Have you seen the Minions Movie trailer? If you've not seen the Minions movie yet, check out this trailer...then you'll understand the error of your ways... haha! Be sure to bookmark this page and keep checking back, as more and more Minions Movie dolls and toys will be added all the time, so don't miss out. In the mean time, if there's another animated movie that you love, and you fancy taking a browse at the sort of dolls and toys that available for them, then take a look through our other featured movies and find a favorite character doll that you love. Here are some ideas to get you going. Simply click on your movie of choice to be taken straight to their dolls and toys. Thanks for stopping by.